Now that we are about into February, I think the teams trying to tank will really separate themselves at the bottom of the NBA. A new entrant to this category is the Memphis Grizzlies. You have to give credit to that small-market franchise because ownership always tried to be competitive and never did a full-out tank job like the Philadelphia 76ers. The Grizzlies made the playoffs each of the past seven years but never past the conference semifinals. Over the weekend, GM Chris Wallace announced some news that should have surprised no one: star point guard Mike Conley will miss the rest of the season to have surgery on his left heel. Conley has played in only 12 games this season and not since Nov. 11, so I'm not sure what the delay was. The Grizz were 7-5 with him in the lineup but have fallen off a cliff since. Obviously, Conley's not tradeable right now with that injury and massive contract, but the Grizzlies could get plenty for center Marc Gasol. It sounds as if for now that the team will keep Gasol and hope it can be a playoff club again next year with a healthy Conley and a top-5 pick in this year's draft. "So, what does that mean for the balance of this season, which to date has not gone as we had planned and hoped?" Wallace said after making the Conley announcement. "Simply put, we are committed to playing hard and playing the right way night in and night out, while developing our young talent." Translation: Guys like Gasol and Tyreke Evans will see their minutes cut so the young guys can play and the Grizzlies get as many draft lottery ping-pong balls as possible. It would be an upset if Evans isn't dealt by the Feb. 8 deadline. (Note: I'll address the shocking Blake Griffin trade for Detroit's next game Thursday.). The Grizzlies ended a two-game slide Monday with a 120-109 win over the Suns. A 42-point second-quarter for Memphis was the difference. Evans had 27 points, his 14th game this season with at least 25, but left with an apparent left arm/wrist injury. Promising rookie Dillon Brooks also left injured. The Pacers won their second in a row Monday, 105-96 over Charlotte. Victor Oladipo had 25 points and Myles Turner 22. Indiana improved to 18-0 this season when shooting at least 50 percent from the field. Indiana is looking to sweep the season series over Memphis for the first time since the 2012-13 season as it ended a four-game losing streak in Memphis with a 116-113 victory on Nov. 15. Gasol missed a 3-pointer with three seconds left. Key trends: The Grizzlies are 4-9 against the spread in their past 13 after a win. The "over/under" has gone under in eight of Indiana's past nine vs. the West. Early lean: Wait on Evans. Orlando was in Houston on Tuesday with Aaron Gordon questionable. The Lakers had their four-game winning streak snapped Sunday in a 123-111 loss in Toronto. 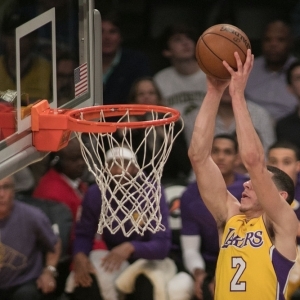 Julius Randle had 17 points and 10 rebounds, and Jordan Clarkson scored 17 for the Lakers. Lonzo Ball was out again and likely won't play here. The Lakers reportedly offered Clarkson to Detroit for Avery Bradley but the Pistons included Bradley in the Blake Griffin trade Monday. These teams split last year and the Magic have won eight of the last nine at home in the series. Key trends: The Magic have failed to cover nine straight vs. teams with a losing record. The under is 6-0 in the Lakers' past six vs. teams with a losing record. Early lean: We'll have to wait on Ball & any banged-up Magic guys (Gordon, Evan Fournier) out of Tuesday's game. The Hornets dropped their second in a row Monday, 105-96 at Indiana. Dwight Howard had 22 points and 11 rebounds but took only three shots in the second half. It was his 697th career double-double. The Hawks snapped a three-game losing streak with a 105-100 home upset of Minnesota on Monday. Kent Bazemore, who is on the trade market, scored 22 points, including a tiebreaking 3-pointer with 2:09 remaining. Charlotte is 2-0 vs. Atlanta this season, winning both at home by double digits. The Hornets split in Atlanta last season. Key trends: The Hornets have covered five of the past six meetings. The under is 7-0 in the previous seven in Atlanta. Brooklyn was at the Knicks on Tuesday again without Rondae Hollis-Jefferson (groin) and Caris LeVert (groin). It's likely D'Angelo Russell will sit this out in the second of a back-to-back. The 76ers lost a second in a row Monday, 107-95 in Milwaukee. Joel Embiid sat out the second of a back-to-back but should be in there Wednesday. The Sixers were an atrocious 2-for-26 from 3-point range. Dario Saric was the worst offender, going 0-for-8. This is somehow the first meeting of the season between these teams. The Nets have dropped the past two at home in the series. Key trends: The road team has covered the past four in the series. The under is 5-1 in the Nets' past six overall. Early lean: Somewhat surprised there's an opening line here. 76ers and under. The Heat won a second straight Monday, 95-88 over Dallas. Hassan Whiteside scored 25 points with 14 rebounds for his 18th double-double of the season. Coach Erik Spoelstra hasn't been playing Whiteside in many fourth quarters and the two had a long conversation about it before the game. Cleveland was in Detroit on Tuesday, so it's possible neither Dwyane Wade or Isaiah Thomas plays here in the second of a back-to-back. The Cavs won the first meeting in this series, 108-97 at home on Nov. 28. Key trends: The Heat are 1-6 ATS in their past seven in Cleveland. The under is 8-0 in the Cavs' past eight in the second of a back-to-back. Early lean: Cavs and under. First ESPN game. New York hosted Brooklyn on Tuesday. Boston completed a four-game Western Conference road trip with a 111-110 victory in Denver on Monday. Jaylen Brown hit a go-ahead 3-pointer with 34 seconds left - after his team blew a 20-point lead -- and Kyrie Irving had 27 points. New York and Boston have split two meetings thus far, each winning at home. Key trends: The Celtics are 2-5 ATS in their past seven vs. teams with a losing record. The under is 6-2 in the past eight meetings. Chicago is back in tank mode as it dropped a fourth straight Sunday, 110-96 to Milwaukee. Zach LaVine was just 2-for-11 with six points in his eighth game back from a torn ACL - his shot has been way off of late as he readjusts. Bulls rookie Lauri Markkanen had 17 points in becoming already the all-time leading Finnish scorer in NBA history. Kris Dunn sat out again with a concussion and won't play here. Neither might Nikola Mirotic, who missed practice Monday with a lower leg strain. The Bulls won't play him with even a minor injury because he's soon to be traded. The Blazers were at the Clippers on Tuesday. Portland won in Chicago on New Year's Day, 124-120 in overtime. CJ McCollum led the Blazers with 32 points, six rebounds and eight assists. Al-Farouq Aminu scored a season-high 24 points. Key trends: Portland is 10-4-2 ATS in its past 16 in the second of a back-to-back. The under is 5-1 in the Bulls' past six. Second ESPN game. Two bad teams, but at least we get someone different on an ESPN or TNT game. The Mavs lost a fourth straight Monday, 95-88 at home vs. Miami. Harrison Barnes had 20 points and Wesley Matthews 19 for the Mavericks, who have dropped seven of eight overall. J.J. Barea missed his second straight game because of a left oblique strain. The Suns lost their fifth in a row Monday, 120-109 in Memphis. Leading scorer Devin Booker was out with a rib contusion suffered Sunday but X-rays were negative. Consider him questionable. The Suns have taken three straight and four of the last five regular-season meetings with the Mavericks. Four of those five have been decided by seven or fewer points. Key trends: The Mavs are 1-4 ATS in the past five meetings. The over is 7-1 in the previous eight in the desert. Early lean: Wait on Booker. We would like to give you $60 worth of member's picks absolutely free - no obligation, no sales people, no credit card information. Use this $60 credit on any of our top NBA handicappers Get $60 worth of premium members' picks free. Also, for a limited time only get three top NBA handicappers for the price of one! Click Here . Get free NBA basketball picks today at Doc's Sports basketball predictions page .